These days it's hard to decide which institution lets down Americans the most, the news media or the White House. Whether he was back to "negotiating against his own side" or paying homage to the ideology -- if not the courage -- of his hero Ronald Reagan, this afternoon Obama ordered a pay freeze for federal civil servants. Will it help? According to the EPI, "In the context of the deficit, Obama will get chump change from freezing federal pay, and will only enlarge the degree to which federal pay lags that of the private sector." Paul Krugman called it "a transparently cynical policy gesture, trivial in scale but misguided in direction." Mr. Edwards found that federal civilian workers had an average annual wage of $81,258 in 2009, compared with $50,464 for the nation’s private-sector workers. Average federal salaries rose 58 percent from 2000 to 2009, compared with 30 percent in the private sector, according to his study. Union leaders said Mr. Obama was playing politics at workers’ expense. “It’s a panic reaction,” John Gage, president of the American Federation of Government Employees, said in an interview. More about the NYT coverage in moment. First, I want to point out that back in August of this year, USA Today turned the Cato institute's misleading statistics into a authoritative looking news story (left). 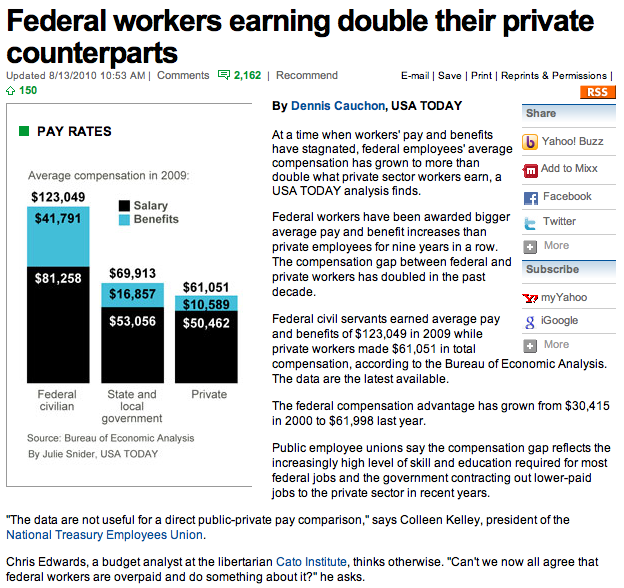 The lede read, "At a time when workers' pay and benefits have stagnated, federal employees' average compensation has grown to more than double what private sector workers earn, a USA TODAY analysis finds." Halfway through the story, USA Today juxtaposed it's own analysis (actually Cato's analysis?) with an alternative point of view: "Public employee unions say the compensation gap reflects the increasingly high level of skill and education required for most federal jobs and the government contracting out lower-paid jobs to the private sector in recent years." On one hand there's an authoritative sounding "USA Today analysis," on the other, it's "unions say...." Who is the reader going to believe? But fundamentally, this is not a "he says, she says" question. One only needs to get a hold of the right statistics -- something neither newspaper bothered to do. Both newspapers seem to believe that following-up misleading figures with a quote from a labor leader (NYT) or a union (USA Today) is the essence of "balanced reporting." The NYT did not even bother to mention -- not even by way of imparting some leftist group's "opinion"-- the fact that differences in education among groups will have a baring on wage levels. But it's not a matter of opinion. Comparing every American in the "the private sector" to "federal civilian workers" -- a group that includes NASA scientists, NIH researchers, and tens of thousands of attorneys and accountants -- is intuitively disingenuous. But you don't need consult your own common sense intuition or the agenda-driven opinions of union leaders. You just need to look at the data. It would be strange if the salaries of federal employees (who are better educated on average) had not risen at a faster rate during the past decade than those of private sector employees overall (who are less educated on average). Data on education and inequality in the US indicate that whereas higher educated workers have benefited from wage increases, the least well-educated Americans have seen their wages decline (chart). While the trend is disturbing, what's driving it has nothing whatsoever to do with the wages paid to federal civil servants. If it is to function effectively, a government must pay its employees a competitive wage.